Source: Galvanic Applied Sciences Inc. 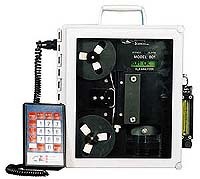 The 801P portable analyzer is a microprocessor-based H2S Analyzer using the principle of lead acetate tape. Designed for temporary service, this device has a 100 foot tape and internal batteries, 12-32 VDC power or AC adapter. The Optical System is composed of a solid state light source (LED) and silicon photo-diode detectors. The software performs diagnostic checks on startup and during operation. The tape drive assembly uses a digitally controlled stepper motor directly driving the tape, eliminating the need for complex drive systems. Spill proof humidifier allows for easy transportation without draining acetic acid. Low power electronics can operate from the internal batteries, 12–32 VDC power or AC adapter. Ideal for spot checks on production facilities. Galvanic Applied Sciences Inc., Bay 6, 6325-12th Street S.E., Calgary, AB T2H 2K1. Tel: 403-252-8470; Fax: 403-255-6287. Bay 6, 6325-12th Street S.E.